For an earlier blog post by the Marine Captain with this unit, Alex Martin, on the nature of piracy, see The Reality of Piracy. Marines doing what Marines were meant to do, taking the fight to the enemy at sea. 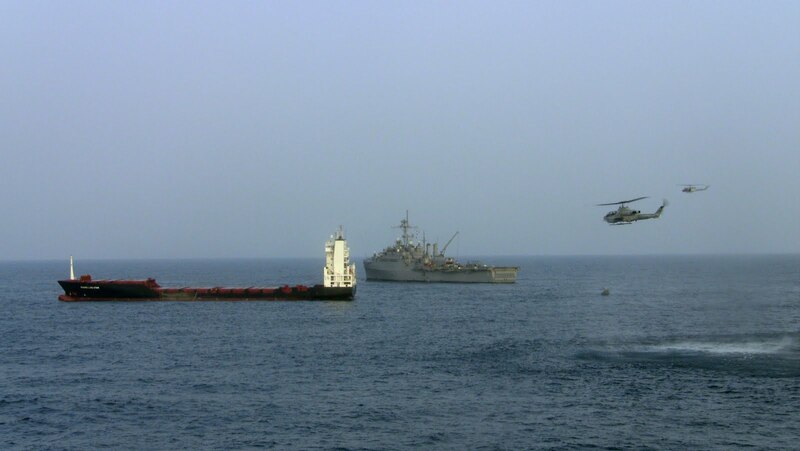 MANAMA, Bahrain – At approximately 5 a.m. local time, Sept. 9, 24 U.S. Marines from the 15th Marine Expeditionary Unit’s Maritime Raid Force (MRF) aboard USS Dubuque (LPD 8) operating under Combined Task Force 151 (CTF-151), boarded and seized control of Antigua-Barbuda-flagged, German–owned vessel M/V Magellan Star from pirates who attacked and boarded the vessel early Sept 8. 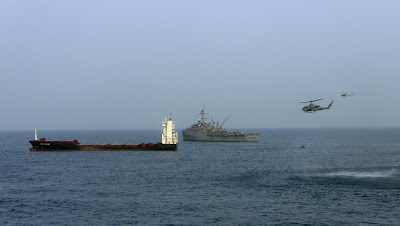 This successful mission by Combined Maritime Forces (CMF) secured the safety of the ship’s crew and returned control of the ship to the civilian mariners. Nine pirates are currently under control of CTF 151, pending further disposition. This ship’s crew has not reported any injuries or casualties. There were no reported injuries from the U.S. Maritime Raid Force. The CTF-151 flagship, TCG Gökçeada, a Turkish frigate, was the first ship on scene, responding to a distress call received from Magellan Star, Sept. 8. Two additional warships assigned to CTF-151, USS Dubuque (LPD 8) and USS Princeton (CG 59) arrived in the vicinity of the attack to provide support to Gökçeada. CTF-151 is one of three task forces operated by the 25 nation Combined Maritime Forces (CMF). CTF-151 was established in January 2009 in order to deter, disrupt, and suppress piracy, protecting maritime vessels of all nationalities and securing international freedom of navigation. Myself Capt. Avtar Singh a mariner transited through Gulf of Aden many times, really appreciate the effort of Naval Forces in area for safe passage of Merchant Ships.